Project managers were scheduled to reveal their decision on the slurry disposal at the next Design Oversight Group meeting on February 5th - that meeting has been postponed until March 5th, 2009. 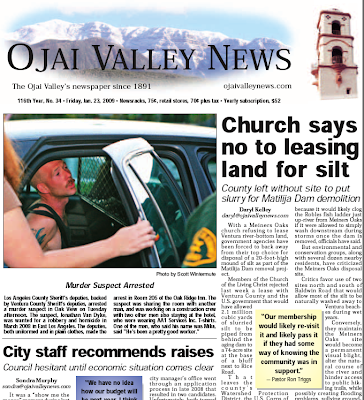 "Church Says No To Silt Lease - County left without site to put slurry for Matilija Dam demolition"
Ojai Valley News, Friday, January 23, 2009. As one of the participants in the many studies and processes that have taken place over the past decade, I would like to clarify some of the issues with the slurry disposal component of the Matilija Dam project. First, the Meiners Oaks Disposal Area (MODA) should be a surprise to those who attended the public meetings during the Feasibility Study and CEQA/NEPA environmental review in 2004. At that time the project description indicated the use of downstream slurry disposal sites near Baldwin Road (now known as BRDA.) During the feasibility phase, the technical study team agreed that the aim of the site selection was to provide temporary storage and allow future floods to flush the silt downstream. This would nourish the floodplain and naturally transport silt to the ocean. The use of the Meiners Oaks site represents a fundamental change in that approach, since the fine sediments would become a permanent feature of the landscape. This presents significant issues, not the least of which is that it will bury the primary trailhead for the Ventura River/El Nido Preserve, one of the only highly utilized public access points within the entire watershed. Secondly, the subheading, “County left without site to put slurry for Matilija Dam demolition,” is misleading. The use of the original (BRDA) disposal area would simply require extending the slurry pipe a mile-and-a-half at most, not trucking as the article suggests. And if you believe the Corps of Engineers preliminary cost estimates, the $5 million price difference is only 4% of the $140 million project. (The difference may be much less if the true cost of revegetation and restoration at MODA is included.) Most importantly, the temporary sediment disposal alternative that stakeholders had supported in the Feasibility Report would provide far greater long-term benefits by providing for the natural restoration of the ecosystem.